[Important Update] Google Chrome version 21 had change the way how we can install user script. Now it only allow user script to be install in the Extensions page and not any page opened. For the latest tutorial on how to install / uninstall user script in Google Chrome visit here. I decided to write a simple guide on how to install and uninstall user script on Google Chrome after many users keep on asking the same question. Sorry for not updating my blog for so long, I will try to free as much time as possible to keep my blog alive in this new coming year! Save to some places that easy to remember such as Desktop as you will need it very soon. Step 2: Find the script you just download. Right-click on it and select Edit. Notepad will be open and it will allow user to edit the script before use it. Skip Step 2 if you do not wish to edit the script or you do not know how to edit the script. Save and close notepad after finish editing. Step 3: Open your Google Chrome and start a New Tab. Drag the script you download just now and drop to Google Chrome. Step 4: Confirm the install of the user script by clicking on Continue at the botton of Google Chrome. Step 5: Click on Install when a pop up ask you whatever you want to install the script or not. Step 6: Done! The script will be install after you click on install. Refresh the page you want to apply the script to get immediate effect apply. You can always check your installed script from Menu > Tools > Extensions. If you want to edit the script to suit your personal preference, just repeat the Step 1 until Step 6 again (remember to read Step 2 in detail!). Step 1: Go to Menu > Tools > Extensions. Step 2: Find the script you want to uninstall and click Uninstall. Step 3: Confirm by click on Uninstall on the pop up dialog. I dropped the script on google chrome but no continue option was show at the bottom. Can you help me with that? The google chrome need to be maximize and you need to make sure the script you saved has .user.js extension at the end of the filename. Please mention this directly in the blog, that the filename must end in user.js. I had to waste a lot of time figuring out why the directions in the post didn’t work, then I had to read the comments. thanks.. but it often times doesn’t work.. especially the timer.. sometimes the timer is advance than the mousehunt timer and sometimes delayed for 1 or 2 min. but thanks by the way.. it helps a lot..
Hi recently on my mac ive updated the recent update of chrome 11 and since, mousehunt tends not to be in sync with the timer. I had already mention this issue on MH AutoBot 1.19 post. 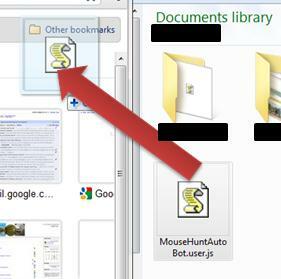 Chrome has some problem on timer, even the mousehunt timer also did not display correctly. For temporary fix, enable aggressive mode or use other browser. hi, recently i’ve been getting this ‘No more cheese!’ message saying that i need to log in to mousehunt first. i encounter this when the script was running without iframe. its been very frequent, about once an hour. is there a way to avoid this hiccup? hi,how do i set my horn time to 1 minute ? I can still install on version 15. Make sure you download the script completely, and rename it with .user.js extension and maximize your Chrome when you drop the file. my couldnt install the script either. Great script there. Just want to find out how I can change the king’s reward warning sound. I understand that the script probably directs to a midi file online, may I know which line of coding should I edit to change it? but if are using Firefox or Opera, the midi is already build in the code it self. Thanks for the prompt reply. Is there any way to change the midi on a firefox platform? You can replace if (browser == “chrome”) to if (browser == “firefox”) and change the URL below. Hi, im using Google Chrome as my default browser. your MH bot is running well but there is no sound when i have kingreward. “True” marked. can help me? thanks a lot. how to change it? is it hornTimeDelayMax? Change TimeDelayMin and Max to suit your need. is there a script for mac? Ya, it work on the Firefox, Chrome and Opera web browser. Not a very good guide, if I have to read the comments to be able to install a script. When you donwload your script from sites such as pastebin, you get a .txt file, not a .user.js file. I had figured step 2 and 3 on my own, before I read the article. But it doesn’t work unless it has the right extension..
With the new Google Chrome update, doing your steps does not work anymore. You need to upload this script onto the Chrome Web Store for it to work. How do I go about using your script without chrome prompting to me that I can only use extensions via their web store? Noted. I will write another tutorial on this. hi please help!why doesn’t it work on chrome 23.0.1271.64 m? please reply asap!thankyou!